Ky is a street–wise thief and a member of the Underground—a group of orphans banded together to survive . . . and to fight the Khelari. Haunted by a tragic raid, Ky joins Birdie and Amos in hopes of a new life beyond the reach of the soldiers. 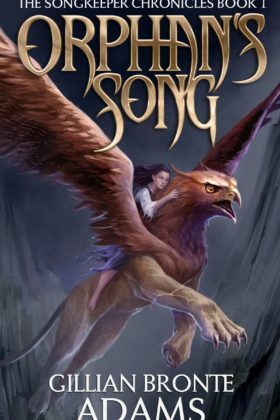 But the enemy is closing in, and when Amos’ shadowed past threatens to undo them all, Birdie is forced to face the destiny that awaits her as the Songkeeper of Leira. Book 1 of the Songkeeper Chronicles series. Gillian Bronte Adams’ novel, Orphan’s Song, begins with the thunderous beat of griffin’s wings and never lets up. This generation’s Songkeeper is in grave danger, as Birdie ventures into a world inhabited by thieves, monsters, and shadowy secrets. Adams’ characters are colorful, witty, and heartwarming. Her tale is a welcome melody that our souls long to sing. A new voice in fantasy, sure to thrill readers of many ages. Will the Song survive or die at the hands of the perilous Khelari? Go get Orphan’s Song now and find out!